Notes: An interesting new gin – new as a new variety but the company has 300 years (founded in 1691) and 11 generations of gin distillers behind the brand . 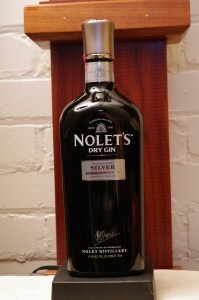 Distilled in Schiedam by the Nolet Distillery . Made in smaller hybrid copper pot/column still ( with a 5 plate column ) that was custom made for the distillery in Bavaria. The base alcohol is a European wheat and is fermented and distilled into a neutral grain spirit (192.8 proof or 96.4 )by someone else but each batch is tested and approved by the Nolet family before it is accepted and shipped to their distillery.European wheat is used as it is a nicely neutral grain which gives you a good foundation on which to add your botanicals without having to adjust to existing flavors such as if you used rye or barley as the grain base The exact mix of botanicals is a proprietary secret. The gin itself is at least a partially compound gin with white peach, turkish rose, and raspberries as the stand out botanicals beyond the usual gin bitter herbs to make a fruit bomb of a gin among many other ingredients to give it a unique aroma and flavor profile. Appearance: Crystal clear, sprightly, a few legs on swirling, which then become droplets on the side of the glass. Slightly oily appearance to body (sign of quality). First Impression: More perfume than a regular gin, rose, , coriander witch hazel and cassia, with citrus and other aromatics adding to the blend. Taste: Medium to light body aromatic blend of fruit, floral, and herbal scents, mild tingling on the lips and tongue lingering finish. Very clean distillation. Slight warming burn on the way down. Drinks: Makes a excellent if somewhat idiosyncratic martini. Good gin and tonic, even makes a interesting Lassi. Just let people know this is not their fathers ( or mothers) gin and they are in for something different . Bottle: A very dark green glass bottle with a softened rectangular shape to it. The white lettering is relatively stark contrast to the dark green glass and large enough to see across to a back bar. The small rectangular black on silver label makes it easy to distinquish also.The top cap is about the size and weight of a fancy tire rim lug nut with a family crest inset in the center – a nice touch really. The entire package conveys a sense of well made luxury or premium goods . So overall we are fans of the packaging and think it serves the gin well in terms of curb or shelf appeal as it were. Other: The Nolet Distillery ‘since 1691’, nowadays runs entirely on Green Power which is partly supplied by Windmill De Nolet. Windmill De Nolet, the highest ‘Stellingmolen’ in the World is based on a traditional windmill used for grinding grain for the Spirits industry of Schiedam, but today the top of De Nolet houses modern technologies that turn the wind power into electricity. Furthermore Nolet Distillery has applied Thermal Energy Storage (TES) to ensure optimal re-use of energy within the distillery. Final Thoughts: A nicely different gin from the usual with some very distinctive accent or spin to the usual juniper London Dry. A fruitier, more aromatic take on one of my favorite substances. Somewhat similar to Hendricks or the summer variations of Beefeaters in that it is a London Dry type with others botanicals either added or more emphasized in a blend to add nuances or spins on a standard. Definitely worth a try or as a addition to ones’ gin library. Website is nicely done with a fair amount of information on the gin, and a well done section on the family history and heritage. Definitely worth a visit.